Apparently the GFGS (Gray For Gray’s Sake) fashion trend is still a thing, as the Syracuse ORANGE, er, gray proved yesterday. In a vacuum, that’s actually not a terrible uniform (if you discount the horrible fonts, shading, truncated pants stripes, etc.) but the problem with GFGS, particularly the lighter shades, is it’s frequently (always?) worn as the “dark” or color uniform versus a white one. This works well for baseball, but on the gridiron, not so much. As you can see here, here and here, there’s not much differentiation between the gray team and their opponents (Va Tech), and the difference was even more pronounced in the dull lighting of the Carrierdome. If your school color set doesn’t include gray, don’t use it. If you must wear gray, then consider asking your opponent to wear their dark/color jersey, so the difference between your unis is more stark. And finally, if you’re school nickname is a color (yes, the history of Syracuse Orange isn’t entirely based off the color), and it’s not gray, you should probably avoid it altogether. You can see more game photos here. The white vs. gray wasn’t even the worst uni matchup (at least according to Joe Ringham, as you’ll see below) on the gridiron yesterday. But it was pretty bad. • Appalachian State wore gold against Louisiana-Lafayette, who wore an all-white uniform with a giant chrome fleur-de-lis. Also, I usually grab an image from Twitter and credit the original poster by linking their tweet, but I think just the tweet with the caption best sums this up. 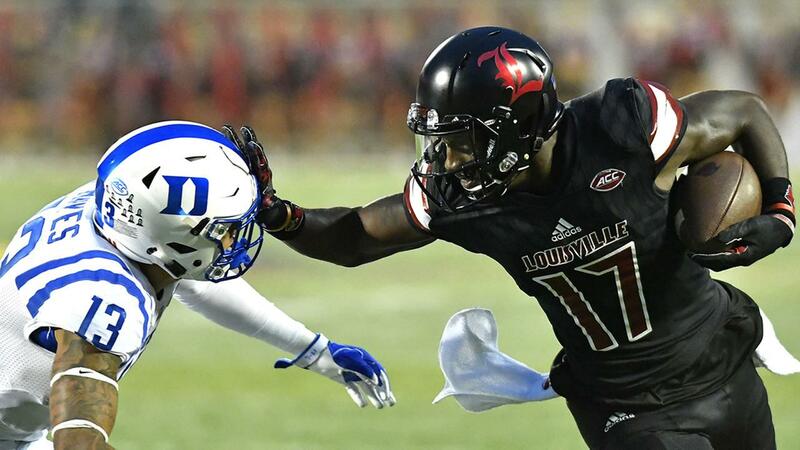 • Louisville wore some pretty miserable all-black uniforms against Duke (the numerals were a total mess). I will say that the one bit of consolation is that much like last week’s Temple/Memphis game, there was a good contrast of black and red vs. white and blue. In addition, the UofL band wore pink plumes (with credit to the UofL Drumline account). • Oklahoma wore their alternate home uniforms against Kansas State. I think I’ve said this in the past, but with a couple of tweaks, I wouldn’t mind this becoming the permanent home uniform for the Sooners. Of course, this would mean getting rid of the texture pattern on the sleeves and helmet (but keep the satin helmets), change the facemask to cream, eradicate the black socks in favor of white, make the cream collar skinnier (or just get rid of it completely), and use a complete NFL stripe on the pants, but this (and the seldom-seen alternate road) have potential. 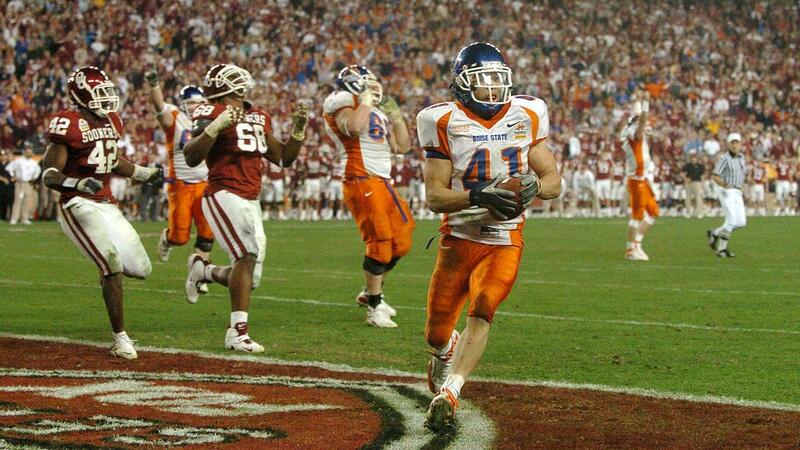 In its current state, I’m glad Oklahoma wears it on occasion: a fun change-up without being worn out. • During the Georgia Tech/Georgia Southern game, I spotted a 3.00+ decal on the back of the of the GS player’s helmet. I assume it’s to recognize players with a 3.0 GPA or higher. • Not the best shot, but Northwestern wore new helmet decals against Michigan State. • Maryland wore all-black against an ironically Packers-esque Minnesota squad. • Virginia looked a bit like the old/new Miami Hurricanes on Saturday. 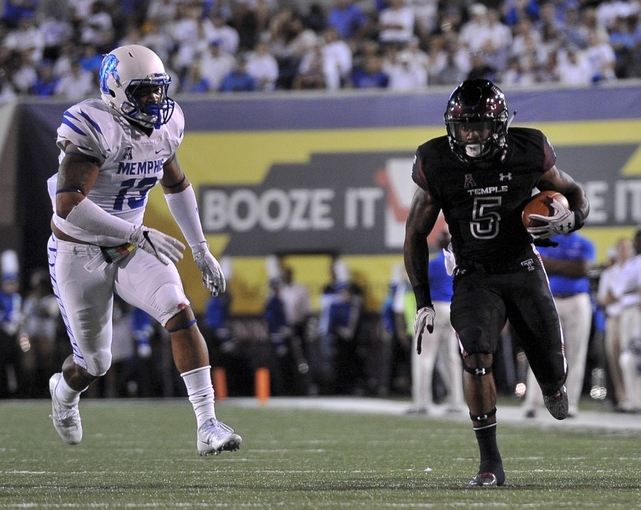 • Middle Tennessee State wore pink chin straps. • Iowa State wore red facemasks against Texas. • Ole Miss wore their light blue helmets against Arkansas, a helmet that I can see a million times and never get tired of. 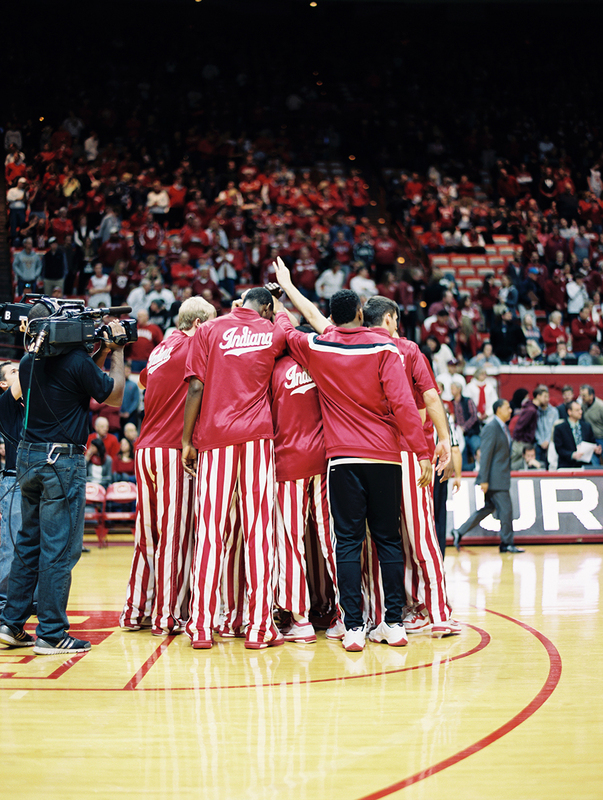 • Indiana wore some new alts against Nebraska. Now at first, I thought they were gonna be wearing the pants featured in the initial promo shot, which invokes that horrific yoga tights experiment from the 2011 Pro Bowl. Thank hell in Equestria that wasn’t the case. 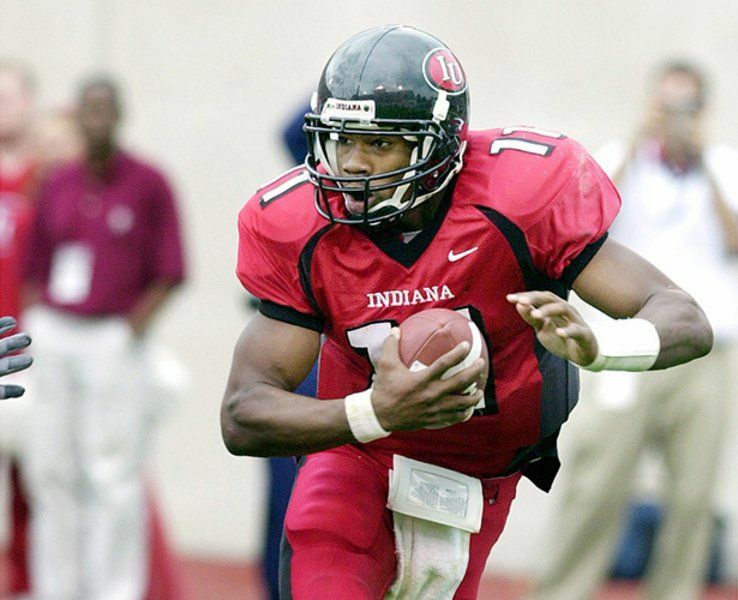 Although I’m not sure about the script on the pants, this is the uniform that the Hoosiers should be wearing. They don’t seem to have a “signature” to their football team in the way their basketball team does, so borrowing from that seems like their best bet. And it works! Not often you get to see vertical sleeve (cap) stripes. I would say keep the block IU on the lids, and figure out what to do with the pants (although an NFL stripe is like a brass snare drum: you can’t go wrong with it), and Indiana will have an instant classic on their hands. As long as we never have to relive the Royalty-Free Aesthetic phase from south of 20 years ago. • Syracuse probably doesn’t give two Tabasco-laden shits about Oklahoma State football, because if they did, they would actually know how to use orange and grey in a uniform properly. This is just woeful to look at. Especially with Virginia Tech in all-white. • There’s a man who paints the mound of his father’s burial ground in orange and white checkerboard before each SEC rivalry game (Tennessee played Alabama this week). • LSU wore their purple jerseys (with white helmets and pants) against Southern Miss. They also wore memorial decals in honor of their live mascot, Mike VI (with thanks to Alex Liggett for the pic). • South Florida brought back their watermelon costumes against UConn. They are of course, for BCA. • UCF wore these helmets with chrome decals for their homecoming game against Temple. 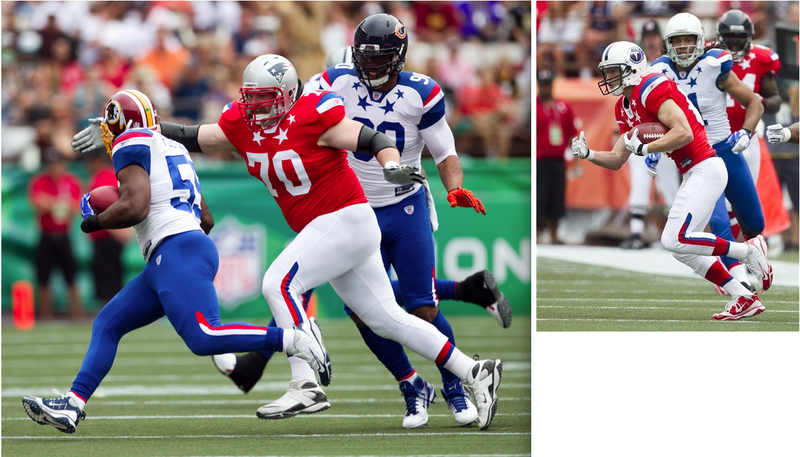 • Matt Barnett sent in these pics of Ohio State’s J.T. Barrett and his slightly-damaged jersey. Thanks TJ! OK, now on to the rest of your SMUW (Note: No Duck Tracker this week, since the Ducks have their bye week). Here are the Uni Trackers for WEEK SEVEN of the NCAA Season. Happy Sunday, everyone. With the conference schedules picking up across the college football landscape, that means that we are getting a ton of good looking games. Such was the case this weekend. Let’s see who made the cut this week. 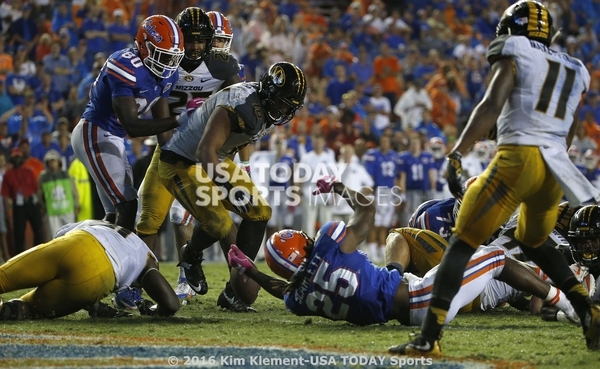 5) Missouri at Florida — Something about the way these two teams’ uniforms looked made for such a vibrant looking game. 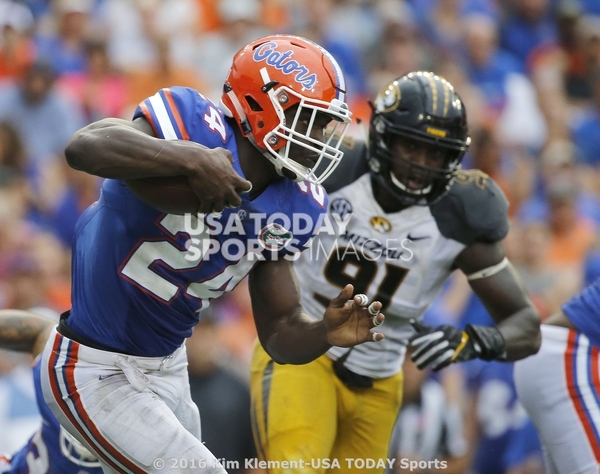 I just loved how the black/white/yellow of Mizzou matched against the usual orange/blue/white home look of the Gators. Just made for a pretty looking game in Gainesville, even if the scoreboard didn’t reflect it. 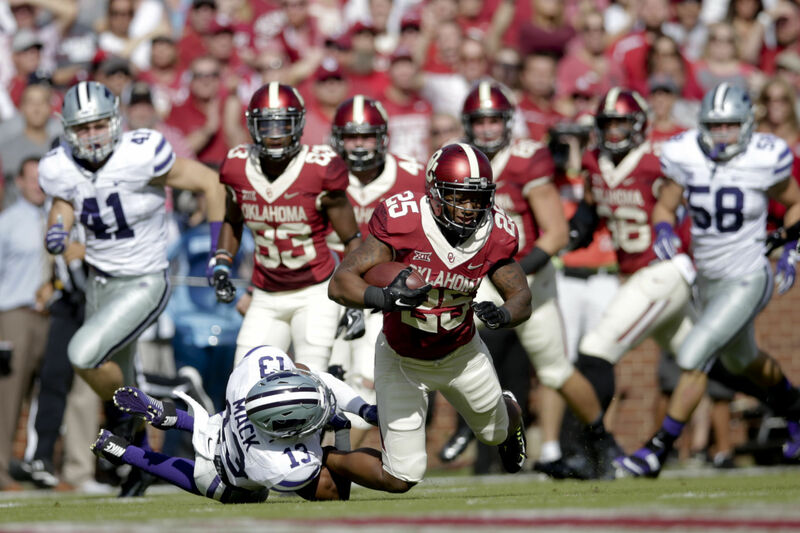 4) Kansas State at Oklahoma — At first, when I saw that OU went with their home woodshed alts, I wasn’t real happy. But, oddly enough, they looked really good against K-State’s always great silver/white/silver road set. A pleasant surprise for me, to say the least. 3) West Virginia at Texas Tech — After I slammed the Mountaineers for a look that included the yellow lids, they go out and use the yellow lids for good today against Tech. They look great when paired with the white top and yellow pants, and the Red Raiders made the game look even better, going white/black/white at home. 2) Memphis at Tulane — A simple, yet fantastic looking game in New Orleans on Friday night. The Tigers looked great in their blue/white/blue road set for this one and it matched up great against the green/green/black home look Tulane went with. Perfect for a little Friday night showcase in the American. 1) Northwestern at Michigan State — I’ve always been a huge fan of the usual green/green/white Sparty breaks out at home. But I absolutely loved the purple/white/purple that the ‘Cats brought out for this one in East Lansing. The mix and contrast of those two made for simply a wonderful looking game, uni-wise, on a Big Ten Saturday in October. +1) Central Michigan at Northern Illinois — I’ve said it before that if you go color vs color, you will get on the list and, more often than not, on the good side. Unfortunately, this color vs color gets put on the bad side, thanks to the costume CMU brought out. Seriously, Chips, that’s just gross-looking. That’s all for me for Week 7. Enjoy the week, and I’ll catch you all next Sunday! 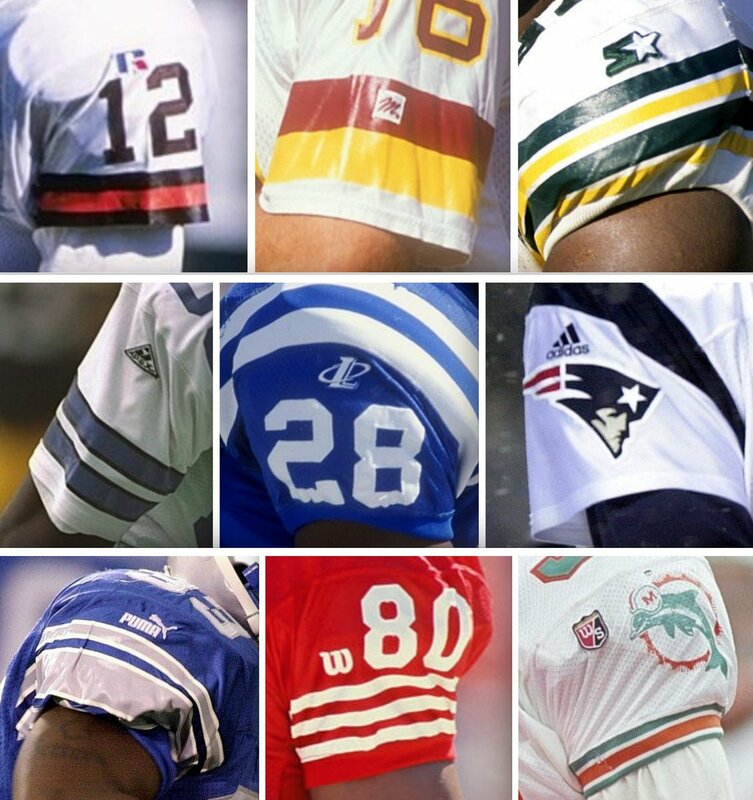 With the New Era logo now appearing on MLB caps, my latest Friday Flashback column on ESPN looks at the history of maker’s marks on pro sports uniforms (including the surprisingly large variety of NFL examples that appeared from 1990 through 2000, which you can see here). In case you’re wondering, those logos are (left to right, top row to bottom): Russell Athletic, MacGregor, Starter, Apex, Logo Athletic, Adidas, Puma, Wilson, and Wilson Staff. Nike and Champion also appeared during the ’90s. Teams were still cutting their own deals, so it was a free-for-all out there. Baseball News: Maybe it’s luck or maybe it’s something else, but the Cleveland Indians wore their blue softball tops again yesterday. This chart shows how often they’ve worn that top at home (both from Robert Hayes). … If you’re looking to “de-flag” the new New Era logo now appearing on MLB caps, it looks like it won’t be that hard to do (from NikoMetsPlus). During yesterday’s game, TBS was using an old image of Santana (from Derek Brownlee). The blue piping no longer used on home jerseys (of course they haven’t worn those since the first game of the playoffs). … Here’s an interesting jersey (guessing that’s a LOTR reference) seen at yesterday’s Cleveland/Toronto game (from Cody The Chicken). … Francisco Lindor again wore his “Believeland” cleats with awful sanis (from John Sabol). … But the Indians continue to win wearing dark blue, taking a 2-0 series lead. … The Blue Jays again wore their own softball tops and have scored one run in two games. I’d expect they’ll ditch them for their home opener tomorrow. … Those Cleveland fans sure are classy (h/t Paul). … If you’re an Orioles fan, you’re probably pissed that Zach Britton never got in the Wild Card game against the Blue Jays, but hey, you can now buy his “game worn” jersey (h/t Mike Chamernik). … This will come as no surprise, but the New Era logo will also be on the WBC caps, moving the flag (the actual flag, not the NE “flag”) to the opposite side (from NikoMetsPlus). … In contrast to the softball top fest in Cleveland, last night the Dodgers and Cubs went white pins vs gray. … Long-suffering Cubs fan Bill Murray was sporting a vintage Ebbets Field cap at last night’s game (h/t Saxon Brack and Graham Maclagan). NBA/Basketball News: CROSSOVER (kinda) ALERT! The Milwaukee Admirals were playing a game in San Antonio, using one of the Spurs’ lockers, when they came across this NBA Sneaker Rules poster (h/t Admirals Roundtable). Also posted in Hockey News. … This article asks which company should sponsor buy ads on the Toronto Raptors jerseys. … Friday night’s Game 3 of the WNBA Finals was scheduled as a home game for the LA Sparks, but the NHL’s Kings had a regular season home game — both play at Staples Center, so the Sparks had to play at USC’s Galen Center. Mario Cuttone notes the Galen had the Staples Center logo on court anyway. Grab Bag: Paul has occasionally featured the various “I VOTED”-type stickers one gets when one enjoys the franchise, and here’s a very cool one from Richmond, Virginia. (h/t Ricky Schumaker). … Yesterday, Everton busted out its third kit, and it’s a beaut (h/t Wayne Muller). And that’s it for today. Thanks to the entire cast and crew of the Sunday Morning Uni Watch. The Penguins home helmets have numbers in Pittsburgh gold. They are just the same font as last 2 seasons alternates. I asked The Pens equipment manager about that. But they are not Vegas gold. It’s not Zach Parise who’s wearing covered Easton gloves but Paul Stastny. Parise plays for the Wild while Stastny plays for the Blues. Zach Parise is the background in the photo. #11 for the Wild. I wonder if those adhesive New Era logos were just for remaining logo-less stock that found its way into the pro shop. It seems hard to fathom that they wouldn’t at least be stitched on if not fully embroidered coming from the factory with the mark. Big 10 tracking is wrong yet again. Michigan state and Nebraska are definitely wrong. Most of the others were right. Illinois was in all white. And Northwestern had a different helmet decal on their purple helmet. Samuel Lam never actually solved the mystery. He just laid out a photo essay discussing it. None of the links from hoosiersportsreport.com of the Indiana uniforms are working (in Terry’s rundown). Yeah, not for me either – you get a “no hotlinking” redirect. OK — I found the offending links and flickred/hosted them myself (there were three of them) all should be good now. It is 10:14pm on Sunday and the links are not working for me. Was just about to say this as well. The website doesn’t allow hyperlinking. They are really great, except for that design on the back. Typical “disruptive” corporate move. James Loney on the Mets wore some type of textured orange sock under his stirrups a few times this year. I didn’t know what kind of sock that was and still don’t…thanks for clarifying what Lindor wears. Paul was pretty adamant that any sock under a stirrup is a sani. It seems a little odd to say one reason the Syracuse Orange should not be wearing gray uniforms is that their team name itself is another color, when their standard/traditional home jerseys are themselves not orange. In general I feel like GFGS bothers me less on a philosophical level than BFBS because I feel like it shares more in common with white jerseys, which every team has as we know. Phil says “if your school color set doesn’t include gray, don’t use it” but does any school’s color set include gray? I can’t think of one…my point is it seems like more of a neutral color that anyone can claim, similar to white. To me this differs from black, which obviously is a color that many schools incorporate into their color schemes to begin with, making it seem weirder to me when a non-black school appropriates it. It’s a shame that the Finals of the WNBA got bumped for a hockey game. Dolphins wearing aqua pants with white jerseys at home. Usually they wear the white pants with white jersey at home. I’m surprised Oregon doesn’t design a bye-week uniform. How about some enterprising person produce clothing dye markers in team colors to cover up the New Era mark? Am I the only one with a really bad taste in their mouth from those Harambe jerseys? GUD went into detail about the 49ers’ 1996 number font back in October 2015. Uh, isn’t this site smart enough to know painting all fans with one broad stroke is a little foolish? Are all Toronto fans bad fans who pose danger to players because one guy chucked a bottle on the field?